The scene was a stage set of sorts, and as with all theater, the place, the people, even the time were of less relative importance than the happening. And it was that, a telling moment. I was at an elementary school concert of third-through-fifth-grade chorus and orchestra as a grandparent doing family duty but also pleased as punch that I could be in a setting of young schoolchildren. There is such magic there — imagination, wide eyes, inquisitiveness — that comes naturally to kids. They are so much like the characters in the many books and stories, fabled and otherwise, that they are bathed in from infancy. That blanket of warmth and security gradually slips to the floor as they step into bigger shoes, and we are all the poorer for that. Would that our adult world had the characteristics of childhood even as it has its realism and responsibility. Children grow up so fast that in a millisecond they seem your elders, and you are learning from them. Of course, if we look and listen, they are doing that anyway in the age group. As a grandparent, you get to observe more than the regular child, who is anything but. There is no “regular” child, of course, just the assortment of the shy, the outgoing, the talkative, the joiners, the daydreamers. So watching these varied types perform in a concert reinforce what you have always known but perhaps have not thought about for some time: There is hope for the future. We were all the irregular child in some way, and others — adults — had hopes for us that for most materialized. Being the grandparent makes you look at the one you particularly know, and to see my grandson in the school setting, surrounded by peers, in a group dynamic, gave me further clues about who he is and where he will go. There is reinforcing hope there, too. Such a personal story was turning its pages, too, for the woman next to me and the fellow on the other side. And for other grandparents. For great-grandparents. For older and younger siblings. And there was a script for teachers as well, trying to get the job done, certainly, after so much rehearsal and following an already exhausting school day. Their efforts seemed magical in their enthusiasm. I do not know how a teacher musters that each and every day. What an under-appreciated group. So, the setting, the place, the time, the kids, the full principals, is not important here. Life, the living of it all, is. The world may be a mess, as it usually is. The job market is shrinking. The presidential race is P.T. Barnum. Maybe the world itself is going to hell in a hand basket, which my own grandparents thought in the 1950s. And theirs believed in the 1920s. But in that Nyack, N.Y., school auditorium, in the compelling moment when you see children open up in a concert as if the spring daffodils had just popped, you cannot help but have goosebumps. Maybe we should all go to school concerts more often. The news clip said that New York City and its suburbs were “paralyzed” by the snowstorm, which dumped two inches per hour and which totaled more than in the famous Blizzard of 1888. OK, but the date was not Jan. 23, 2016, but Dec. 26, 1947. Life, it seems, is deja vu. Yet there are differences between the two snow events, and I use that phrase because it is part of the contrast. In 1947, the few media outlets delivering live news would never have reported on a “snow event,” just a snowstorm. Language often gets inflated when you hype something. And weather is a most-hyped event in this age of instant news via smartphone, tablet, computer and ever-repeated TV segments. Yes, the snowstorm that hit my area in lower New York State was big enough, though on my mailbox indicator, it was slightly more involved than average. I have lived at my Blauvelt address since 1973, and we have had a few storms that almost buried the mailbox, which is about 3.5 feet off the ground. This system came up about 1/3 the way. And while some had high winds, we did not. A big storm, but not the biggest. The 1947 newsreel indicated that millions of dollars were spent or never realized in cleanup costs and lost business. And, of course, there were associated injuries, even deaths in the storm. Truly sad. But in 1947, there was little hype about the coming snow. It came quickly, the day after Christmas, and common sense got everyone as prepared as they cared to be. Kids enjoyed the extra holiday present (including my brother and I, then living in Sloatsburg, N.Y.). But I don’t think bread flew off the store shelves or gas stations had lines with motorists fueling up as if rationing would soon begin. It’s now a faster-paced world, and “news” has the shelf life of a few seconds. Hype seems the only way to get people’s attention. Yes, and no one had to hype that. Literally, if you think about it, re-tying one’s shoes can pause your life just enough to alter things. It’s the same argument that if you had left the house one minute later, you might never have seen her face. Write your own story, but you see what I mean. Now, is this fate? Karma? Heavenly direction? Just dumb luck (or the reverse)? And if you don’t think about it — any one act slowing or moving ahead your life’s clock — how will you know the difference? Do not mean to get philosophical here, but surely we can all recall a delay or speed-up (you left the house early because you awakened early) that made that particular day different. And then maybe you took that day and made some more of the same because you liked it so much. And that changed your life. This isn’t to say free will doesn’t have play, that you are not the master of your fate. We largely are, though what we consciously plan may never come to past. However, we must move on, roll with the punches (or be grateful that we were forced to smell the roses). It’s the adaptation that largely involves our free will. So, how did all this thinking arise? Did I have too much wine? No, I really did re-tie my shoes this morning. My usual laziness has me just slipping my large feet into already tied shoes, but this time they needed a re-tie. So I did that. It made my day. Not the re-tie. I wasn’t in the best mood — down a bit — and I was simply plodding through routine when I noticed this father carrying his young daughter through the local home improvement store. The child had the most wondrous face — so very bright, lit up, cheerful, inquisitive. And in her hair she had an equally wondrous artificial flower. My mood changed. The little girl did the trick. And had I not re-tied my shoes, well, darn, I would not have seen, would not have been in the moment. Reaching for the 1800s front door knob at the Edward Hopper House the other day, the Nyack home of the famed American realist painter, it occurred that perhaps more than a million turns to that piece have happened in the nearly 158 years it has been on North Broadway. There would have been Hopper’s grandparents, the Smiths, who built the house. Then his parents Elizabeth and Garrett as well as sister Marion. Hopper himself, who was born in 1882. Then so many relatives, visitors over the almost 110 years the family had the house. When the home, in disrepair after Marion’s death in 1965 and Hopper’s in 1967, was rescued by historian and community preservationist Win Perry and many other volunteers in the 1970s, they all touched that door knob. The house then became an art center and Hopper artifacts museum, and the door has opened to many visitors since. The knob, brass with filigree, has really assumed polish with constant handshakes. Over the decades, if you apply arithmetic at 20 turns per day, 365 days a year, 158 or so years, that’s more than a million turns. Plausible. 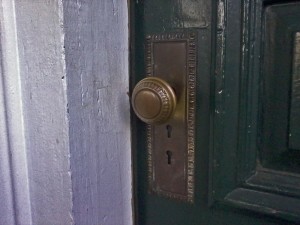 Many Nyack homes have their original door knobs, and they are still working. And why shouldn’t they? I have dismantled the Hopper House door knob in regular maintenance, and I report that it is full brass with an adjustable, threaded steel shank and screws to hold the knob in place. Two knobs — one inside, one out — are set in brass escutcheons, as you can see from the photo above. Very well-constructed, made to last, a tribute to old manufacturing. And this is not a fancy door knob set. Consider that a kerosene deliveryman opened the door weekly before electricity came to Nyack and Hopper House in the later 1800s. Then coal gas installers. The telephone guy. Then all the early 20th century deliverymen — milkman, baked goods supplier, laundry man, etc. Birthing doctors and midwives turned that knob. So did undertakers. Edward Hopper, when he visited his sister, gave the knob a twist, and who is to say he did not turn the door knob and push the door open with his foot so he could bring in or out one of his masterpieces, now selling for millions? The tales a door knob could tell — at Hopper House, at your own. While you cannot go home again, the gods, and nature, can make you think you are in a dream of past time, place. That was my experience Tuesday last when at 2:17 a.m., I rolled into Spring Valley, N.Y., the village of my youth. 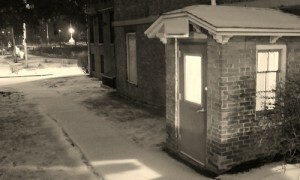 It was a snowy morning, the first such in the warmest Northeast December on record. Though where I grew up has changed in appearance, even some function, and so very many of the old storefronts, and, more important, their business people, their customers, are gone, the fresh snow that morning was like the white scene in “It’s A Wonderful Life.” A blanket of white is in metaphor the handmade down comforter on a four-poster bed. It simply evokes the warmth of childhood. And that’s what I felt, what I saw in my mind’s eye as I drove into the community of my father, my grandfather, my friends, my teachers and some special people. Times, places change, and you may no longer have the keys, but memories can unlock what was yours. Fresh white levels the field, literally, since the color of snow is the universal hue. A snowman, no matter who builds it in whatever age — in front of your house or what was your home — is yours. It was with a bit of whistle, or the sounds that pass for that from a man without rhythm, that I drove through Spring Valley’s snow, headed to the regular Tuesday gig as a non-profit cook who tries not to poison anyone. While any Tuesday morning at the United Church is routine — knocking large pots about, getting 15 pounds of pancake batter ready, muscling the ancient oven for baking, opening eight no. 5 cans of soup and bringing flavor to that, plus the myriad tasks that are done so that later Phyllis, Carol, Moucille, Mary Anne, Denise, Elnora, Christine, Olive and sometimes others can add their magic — the snow, still falling and glistening in the streetlights, made the effort festive. The fact that at this time of year, the homeless in Rockland can participate in the Safe Haven overnight shelter program and not see the snow as an enemy removed any guilt in enjoying the white stuff. The Rockland Interfaith Breakfast Program, begun in 1985 by a group of clergy of various faiths in Rockland County, has had many volunteers for Monday-Friday breakfasts in its long, continuous run. There have been numerous snowy days, and not all were as easy to drive in as last Tuesday’s, though the volunteers are tough, and there have been rare times when staff was low. 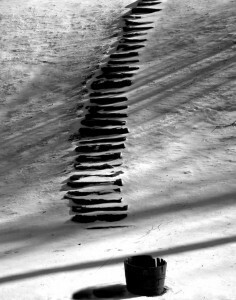 Whatever motives push a volunteer to his/her task generally stay in the mind, the heart, and, of course, the soul. Volunteers figure they are lucky to do what they can and want no recognition, God forbid. That would redirect the spotlight from the good being done. Yet the rewards are many, and sometimes the gods give a fellow a bonus, as it were, like the Currier & Ives scene of my old hometown on a snowy, early morning. I saw so many on the deserted streets that day, and I had not seen them in decades. The writer is a retired newspaperman who can be reached via ahgunther@hotmail.com All essays can be reproduced.